Denver is one of the few international airports without a rail link — a vital source of efficient and low-carbon transportation. The new expansion will bring important new facilities to the airport and will connect it to the city core at Union Station with a FasTrack line terminating at Calatrava’s new arched transit station. The rail line will travel across a new rail bridge over Pena Boulevard and then heads straight into the heart of the commercial plaza and adjacent hotel. The twin-tower, 500-room hotel was designed by Gensler and it fulfills the original 1995 airport plans to have a hotel on site. If you’ve ever gotten stuck at DIA, this new on-site hotel and conference center is a welcome addition compared to the distant off-site hotels you get sent to when you have to stay over night. The four additions to the airport will sit directly next to the existing peaked-roof Jeppesen Terminal along the same axis. Travelers coming to the airport will enter from the train station through bright, white vaulted rooms with translucent ceilings that let in natural light. A new plaza directly above the station will connect to the main arrivals area and have dramatic views of the Rocky Mountains to the west. If you're going to the city of Denver you won't even need a car! No parking fees, no gas....sounds pretty convenient to me. Imagine the jobs it'll create?? I can live without seeing DIA...I think this is a work of art that's even better than DIA. Who will pay for the cost of the hotel? Why are we blocking the image of the best airport in the USA with this Great Wall of China? The new expansion will fulfill the original 1995 plans for the airport to have a commuter rail line and on-site hotel. The FasTrack line will run from downtown Denver's Union Station across a new rail bridge over Pena Boulevard, terminating at the airport. Travelers will arrive in an open-air train station under bright, translucent vaulted space before entering the main airport. The expansion will also include a new retail and commercial plaza with grand views of the Rocky Mountains back to the west. 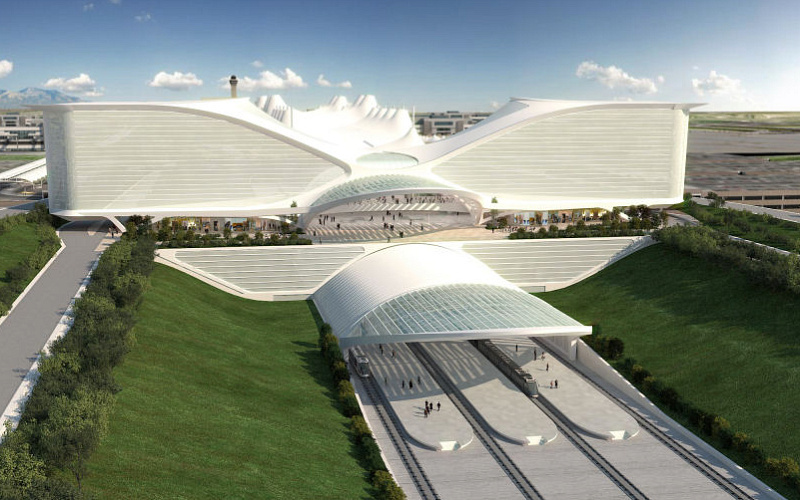 The new rail line, station, twin-tower hotel, and plaza will be built along the same axis as the airport terminal. Santiago Calatrava was in Denver on Thursday, July 29th to unveil the design for the South Terminal Redevelopment Project. 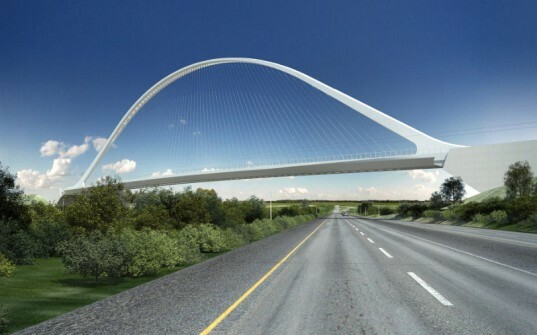 Calatrava has made a name for himself designing impressive arches and daylit rail stations and bridges. The hotel, which was designed by Gensler, will have 500 rooms in two towers on either side of the station. 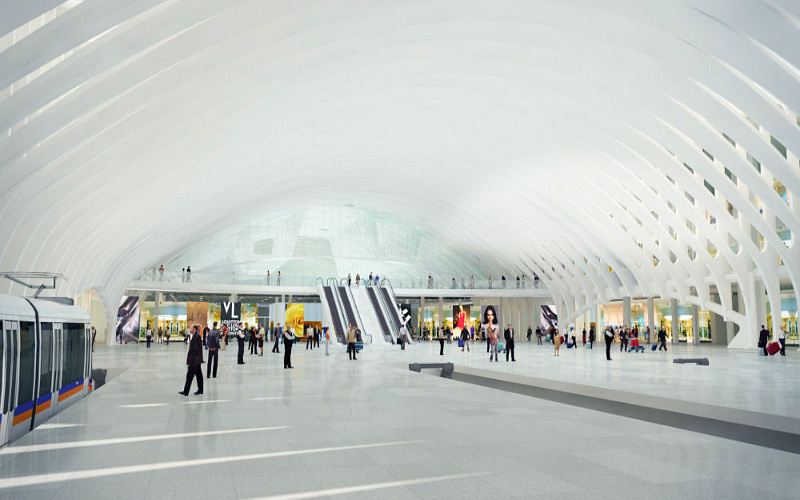 Calatrava's design for the new expansion is meant to complement the existing Rocky Mountain-inspired terminal, providing space to view the peaks, but also adding a more international flair to the airport. This first phase of the redevelopment project will include the train station, plaza, hotel and rail bridge and is estimated to cost $650m. A second phase of the redevelopment project will include a new parking structure and renovations to the Jeppesen Terminal Great Hall and is estimated at $250m. Denver is one of the few international airports that does not have a rail link from the city core. Denver is one of the few international airports without a rail link -- a vital source of efficient and low-carbon transportation. The new expansion will bring important new facilities to the airport and will connect it to the city core at Union Station with a FasTrack line terminating at Calatrava's new arched transit station. The rail line will travel across a new rail bridge over Pena Boulevard and then heads straight into the heart of the commercial plaza and adjacent hotel.